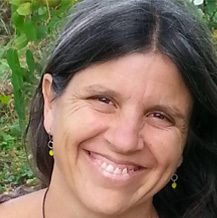 Sasha has been practicing yoga for 21 years and began teaching at Yogaspace in 1997. Her Vinyasa classes focus on stability, body alignment and maintaining a constant connection between movement and the breath. The effect is a slow, deep, meditative class which leaves one feeling strong and open. Sasha also runs the pre-postnatal program at Yogaspace. She has been a practicing doula for 25 years. Helping families prepare for birth and parenting is her passion. She teaches prenatal yoga, birth preparation classes, prenatal partner yoga workshops and a prenatal teacher training program. Her prenatal classes and workshops provide her students with a sanctuary in which they can cultivate confidence, share experience and explore the bodies’ inherent wisdom to birth. It is a nurturing environment for students on their journey towards parenthood. Having attended over 750 births and having educated many more new parents about birth and early parenthood, brings a richness and depth to the prenatal program. Sasha wants to thank the many women she has worked with over the years. She feels honoured to have been with them during such an intimate, precious time in their lives and has learned so much from them all. “Love Yogspace! Both before, and now as a pre-natal yoga student. Facilities are fantastic, and Sasha was fantastic – came over and introduced herself as I was new and addressed any questions I had – class was welcoming, good pace and and positions were very helpful as I prepare for birth.” – Linda F.
“Sasha is pure magic!! Thank you!” – Melissa R.
“Sasha’s prenatal was awesome! I’d highly recommend it to pregnant ladies looking to reconnect with their bodies and bring love, awareness and focus to their growing babies:)” – Jazmine S.
“I travelled from Barrie to attend Saaha’s prenantal class last Wed. It was incredible, more like a workshop than what I would expect from a class. I was truly inspired. I work and tech at a studio in Barrrie and have been spreading the word as to how phenomenal your space is and how inspirational Sasha’s teachings are. Namaste!” – Michelle H.
“Had a great experience at Yoga Space. The prenatal class was lovely, great energy from all the women in the class and I loved Sasha. The room we had our class in was great as well, it was a FULL class but didn’t feel cramped at all.” – Amy S.